This week's news that J. Crew multichannel customers spend twice as much as single channel customers, coupled with the fact that 49% of their customers are "multichannel" (source = Associated Press via Paul Stuit's weekly newsletter) suggests that a "brand" better have a sound multichannel platform to succeed. Here's a question for those of you who advocate multichannel strategies, products or services. Based on your analytical studies (and if you're a multichannel retailer that is worth your salt, a reputable research organization, or a multichannel vendor, you've already studied these factors before talking about the importance of being "multichannel" in a public forum, right? ), where does being a "multichannel customer" fall on the value chain, compared with the following statements? Customers who visit your website multiple times a month are worth "x" times more than customers who visit your website one time a month. Customers who purchase from multiple stores are worth "x" times more than customers who purchase from just one store. Customers who purchase from multiple merchandise categories are worth "x" times more than customers who purchase from just one merchandise category. Customers who purchase in multiple months are worth "x" times more than customers who purchase during only one month. Customers who have multiple items in their order are worth "x" times more than customers who have just one item in their order. Customers who order multiple times a year are worth "x" times more than customers who order just one time per year. Customers who ship merchandise to more than one address are worth "x" times more than customers who ship merchandise to just one address. Customers who use multiple payment methods are worth "x" times more than customers who use just one payment method. Customers who purchase from multiple store employees are worth "x" times more than customers who purchase from only one store employee. Customers who purchase full price and promotional items are worth "x" times more than customers who only purchase full price or promotional items. Customers who use multiple search engines are worth "x" times more than customers who only use one search engine. Customers who click on multiple links off of your homepage are worth "x" times more than customers who only view the homepage. Customers who respond to e-mail marketing, catalog marketing, portal marketing and search marketing are worth "x" times more than customers who only respond to one style of marketing. Customers who shop your outlet stores and full-price stores are worth "x" times more than customers who only shop one price channel. In other words, rank order these statements in terms of true incremental value to your business. Is being "multichannel" important, or is it the only metric you actively measure? We studied statements like these at Nordstrom ... "multichannel" customers were not the most valuable among all the customer types listed above. You think about your business differently, once you assign value to each aspect of customer profitability. Your turn --- how important is being "multichannel", compared with the other statements listed in this post? In college, my summer job was "Playground Supervisor". For eight weeks, from 9:00am to 11:30am, 1:00pm to 4:30pm, and 6:00pm to 8:30pm, four days a week (closing down at 5:00pm on Friday), I was partnered with a young lady. It was our job to corral anywhere between ten and forty youngsters, ages five to maybe sixteen. We had to plan activities that weren't too advanced for the five year olds, weren't too childish for the sixteen year olds. There wasn't a better management lab than playground supervision. Some kids were needy, some were mean, some were sick, some were shy, some were outgoing. We earned $4.00 per hour, considered a good summer wage at the time, trying to balance the needs of three dozen kids. We had maybe eight or nine playgrounds across the city of Manitowoc. Attendance at each park was directly tied to the environment created by the playground leadership team. Some parks had a half dozen or dozen kids during each session. Other parks had between thirty-five and fifty kids attending each session. All it took was effort, activities and kindness to bring the kids in. I recall there being a sixteen year old who liked to stir up trouble. Overall, this kid had a good soul. But from time to time, he liked to pick on various people. Each Friday morning, we spent several hours at the municipal pool. His job was to drown me. My job was to let him drown me. Our management team thought it was good for the kids to try to torment us in the pool. At times, I'd have six or seven teenage boys trying to drown me. Those were heady times. Imagine what a lawyer would think of that in the year 2007? After a few weeks of incessant horseplay, I became frustrated. It became my mission to find a way to "get even" with this kid. My opportunity came during a game of dodgeball. This young man was standing all by himself, no more than fifteen yards away from me. I had a perfectly-sized playground ball in my right hand. Seeing the opportunity to toss this ball at a high velocity toward the teen's belly, I reached back, and with all the strength I could muster, catapulted the ball toward the bully. The young man was quite agile. Realizing this whistling weapon would cause undue damage to his abdomen, he dove to the ground, his face full of fear. As the teen hit the ground, I saw a young boy, five years old, standing maybe ten yards behind the teen. This young boy was not watching the epic struggle between sixteen and twenty-one year old. No, this boy was probably daydreaming about strawberries or frogs or Max Headroom. No sooner than I could yell "Watch Out Harold! ", the projectile struck the innocent youth flush in the left cheek, pushing Harold's head back at the velocity of the playground ball. The force of the impact lifted Harold's tiny little feet airborne, much like a teeter-totter. The back of Harold's wee-little head hit the pavement first, followed by his hands, buttocks, and finally, his previously airborne feet. Lord knows how Harold felt. I know how I felt. I realized that I may have killed Harold! Five seconds later, air returned to Harold's lungs, and he began to cry at decibel levels reserved for jet airliners. At that moment, forty children, a mortified playground leader, and a laughing sixteen year old bully stared at me like I was the anti-Christ. No amount of apology solves a problem of this magnitude. I remember Harold wiping the tears off of his little face, a face that was half pale, half bright red, swollen slightly out of proportion. He quietly sobbed as he walked to his bike, mounted the vehicle, and peddled home. Harold never came back to the playground. As leaders, how often do we inadvertently do harm to the employees placed in our care? How often do our petty battles and problems with various leaders cause situations that spill over and impact folks like Harold? Worse, how often do we not notice the damage we do? Many years ago, it was my job to create a catalog marketing strategy that would significantly increase the profitability of my division. I worked hard at developing something new, innovative, and different. Mysteriously, I came up with something that 'worked'! I shared the plan with a member of our executive team. This person showed moderate disinterest in the plan. Nearly eight weeks later, I was on vacation when I received a phone call from one of my analysts. My analyst informed me that the executive came to my team, told my team they needed to re-work the entire catalog contact strategy and sales forecast, and gave them a plan to implement before the end of the week. The executive either planned to do this, or circumstances forced the executive to do this, or it was an honest mistake. Regardless, my work was stolen by this person. This person got the credit for a strategy that was several million dollars a year more profitable than what was being done at the time. There are many times when you 'want' your work to be stolen by others. When you are in Database Marketing, it is your job to 'influence' others, you don't lead the merchandising or creative team. So, you float ideas and concepts out there that other executives run with. This happens all the time. The best Database Marketers are utterly gifted at this style of management. But there are times when your work is blatantly and brazenly stolen. When that happens, how should you react? Are there instances in your career when somebody stole your work, and received credit for it? How did you handle the situation? How did the situation resolve itself? These days, you cannot toss your remote at the television screen without bumping into televised poker. Given my analytical background, I'm fascinated by poker. Given my business background, I'm fascinated by poker. There are many ways that the dynamics of poker mirror real life. Let's explore some of the light-hearted ways that poker applies to our industry. Social Media Gurus: Your blogging and social media experts sit at the poker table with laptops ablaze, using Twitter via a wireless internet connection to "have a conversation" with their social network, soliciting their "community" for betting help. Catalog Marketers: We tend to like "sure bets", things that have a proven return on investment. We wouldn't invest in a 7-2 offsuit, we'd bet A-K suited like our lives depended upon it. The catalog marketer thrives by winning numerous small pots. It is unlikely you'll ever see us bluff to win a hand, even though we logically know we have to take risks from time to time. Online Marketers: These folks would test many different scenarios, always trying to optimize performance. They would play hands differently against the same opponents, so that they knew which strategy worked best. Similar to the catalog marketer, the online marketer thrives by winning numerous small pots. Different than the catalog marketer, the online marketer thrives by betting "after the flop", optimizing strategy much in the same way one optimizes conversion with customized landing pages. Brand Marketers: The most exciting players at the table! They move "ALL IN" without hesitation. A select few hit it big, winning tournaments, gaining notoriety. The vast majority flame out quickly, and move on to the next table. All talk about the importance of developing a "persona" at the poker table. All of these players remind us about the importance of "building a brand" over time --- that the success or failure of any one hand or one tournament is not what it is about. These folks have extensive debates about whether wearing dark sunglasses is good for the brand image of a player. Other folks at the table believe the brand marketers bluff a lot, but the brand marketers earnestly believe their strategy is right. They will cull examples from Apple, Starbucks or Nike to defend their point of view. Market Researchers: Similar to the social media gurus, the market researcher asks a focus group of highly targeted poker fans which strategy is best for any given hand. Whereas the social media guru draws upon a worldwide empire of online friends, the market researcher polls the actual audience in the casino for advice. Business Intelligence Analysts: These experts are likely to develop a KPI dashboard that highlights the specific scenarios when winning is most likely. Heated debates about various hands are matched by heated debates whether Business Objects or MicroStrategy provide the best dashboard development environment. Web Analytics: Everything is about "conversion rate" for these folks. Each hand is recorded in real time in Google Analytics, showing where players abandoned their hands (aka shopping cart abandonment), illustrating which scenarios yielded winning hands (aka conversion rate). Finance: Your finance department wants a detailed business plan that demonstrates, prior to the start of the poker tournament, how you will end up in the top ten percent of players --- the group that win money in any poker tournament. The finance department is less interested in whether you win or not, they simply want to know that, over time, you will consistently finish in the top ten percent. The finance team is unlikely to play in the tournament, given how much riskier poker is than opening new stores or investing in Canadian currency. Human Resources: You'll want at least one of these folks at your table. They will intervene should a player rub your face in a bad beat. They'll also make sure that food and restroom breaks are conveniently scheduled throughout the tournament. Operations: The operations executive is unlikely to play in the tournament. Instead, the operations executive will play the role of the dealer. Going largely unnoticed, the operations executive never wins or loses. However, the poker tournament cannot happen without the operations executive playing the role of the dealer. Merchandising: Your Chief Merchant is unlikely to play poker, but will identify the best poker tables, decks of cards, and poker chips to be used in the tournament. Each year, the table, cards and chips are "better than last year", are "trend-right", and are "really popular in London or Milan". Creative: Your creative executive will probably not play in the tournament. But the look and feel of the tournament cannot happen without the creative executive. S/he will determine the appropriate level of lighting, and will take aspirational photos of the competitors, so that next year's tournament will be more appealing to a larger, maybe even younger audience. E-Mail Marketer: You'll get a mixed bag of individuals here. Highly reputable e-mail marketers will send targeted verbal messages to competitors, telling the catalog marketer that she has a pair of Jacks, knowing that the message will cause the catalog marketer to fold. Spam-based e-mail marketers just yell random, loud messages, non-stop, to anybody and everybody. The spam-based player bluffs all the time. Information Technology: In spite of all the needs of the tournament, all anybody wants from IT are earplugs to block out the spam-based e-mail marketers sitting at the table. Now that I've frustrated many of you by not aligning with catalog industry best practices (i.e. the right way to implement results from a "matchback" analysis), allow me to explain the philosophical issues surrounding the methodology. Catalogers like to look at a "segment" of customers, folks with similar behavior, folks with consistent future performance. For instance, assume it costs a cataloger one dollar to mail a catalog. Also assume that thirty-five percent of all demand flows-through the p&l, resulting in "contribution" or "variable operating profit". We mail a catalog to this segment of 10,000 customers, folks who last purchased within the past three months, and have spent $250 - $499 in their lifetime with the company. In other words, we lost money mailing this segment of customers. This is where the matchback analysis comes in. Savvy catalog marketers partnered with list processing and compiled list vendors to "match" all customers who received a catalog, but ordered online instead, "back" to the catalog mailed to the customer. Typically, the most recent catalog mailed gets credit (and we can address all the flaws with that methodology another day). Now all is good in the world! The catalog drove online volume, the profit and loss statement works. 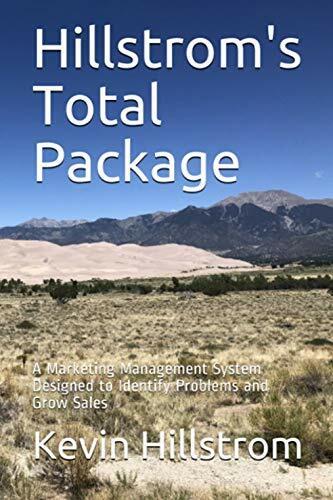 Catalog list processing vendors, compiled list vendors, paper vendors, and list rental vendors rejoiced because the catalog becomes a viable marketing vehicle responsible for the majority of the online volume harvested by a business. This strategy works well when the online channel is incapable of generating its own volume. In 2007, this is often an incorrect and dangerous assumption. This is where mail/holdout testing comes into play. Simply put, mail/holdout testing shows you how much online volume occurs if a catalog isn't mailed. The methodology points out the fundamental flaw in a matchback analysis. For many catalogers (certainly not all, maybe not even half), half of the online demand will happen anyway if a catalog is not mailed. In these instances, the mail/holdout testing clearly illustrate this finding (see the last article, business model number three). In this case, the segment is above break-even, so depending upon your profitability criteria, the segment can be mailed next year. It is this last profit and loss statement that catalogers need to be evaluating. Almost all catalogers are mailing too many catalogs due to flaws in the implementation of the matchback analysis. This isn't the fault of your list processing or compiled list vendor. It is our fault, we failed to adequately understand customer behavior. At Nordstrom, when we killed our catalog division, our online division actually continued to grow sales, year-over-year. Matchback analysis suggested that killing the catalog would create a catastrophe. Our inventory management team nearly fainted, thinking the implosion would be epic! Mail/holdout testing accurately forecast a subtle sales hit that would largely be offset by organic growth in the online channel. Within a month of killing the catalog, we observed that mail/holdout testing was right, that matchback analyses were highly flawed. Another flaw in the implementation of matchback analysis is attributing online orders to the original source (which in most cases, is catalog). In other words, the catalog marketer gives the online channel credit for taking the order, but says that the order could never have happened had catalog marketing not been responsible for originally acquiring the customer. This analytical technique assures that catalogs will always gain too much credit --- in these cases, I've seen orders generated by paid or natural search (i.e. Google) attributed to catalogs, because the customer was acquired via a catalog twelve years earlier. I'd stay away from this popular method of attribution. I realize what I am saying is utter heresy to most in the catalog industry, as evidenced by the feedback I receive from you! As leaders, we have a responsibility to maximize sales and profit in the business models we support. Let's measure the evolution of our business in a fair manner. We need to take our catalog silo hat off, and put our brand hat on. We'll still find that catalogs are an important part of the marketing mix used to educate customers about our merchandise offering. We really lit up the readership meter yesterday when we discussed Multichannel Business Models. Monday was one of the top five traffic days in the history of the blog, that post was the most read post of the day by a wide margin. I'll take that as affirmation that multichannel business models are of interest to you, the loyal MineThatData reader. Let's expand upon yesterday's discussion. A common question I hear is "How do I, with the data I have available to me, determine which business model my brand is classified in?" Good question! Let's explore each business model, and some of the things you're likely to see. We'll explore each business model by looking at results from mail/holdout tests, comparing dollar per customer metrics. Notice that almost no online demand is generated by the mailing of the catalog. Also, if the catalog is not mailed, virtually no online sales occur. This clearly tells you that the website is just "there", customers are not really using it to order merchandise. Notice how different this table looks. In this business model, demand is driven to the online channel when the catalog is mailed. Notice that almost no online demand occurs in this scenario. So, the catalog drives orders online, but the online channel is not yet capable of generating its own incremental volume. The online channel is a glorified order form. Notice the significant differences in this business model. If the catalog is not mailed, half of the online demand occurs anyway. This is a view that many catalogers are missing these days, due to an over-dependence upon matchback analyses. In this case, $3.40 of demand per customer were generated. However, the matchback analysis indicates that $6.00 of demand per customer were harvested. If the cataloger goes with the latter, the executive team will significantly over-circulate catalogs, causing profit to be sub-optimized. This is probably the most significant analytical error happening in our industry these days --- our list processing, compiled list vendors, industry experts and and paper representatives have unknowingly pushed us down this path, and we let it happen. Nobody is to blame, it's simply our responsibility to do a better job of analyzing the business models we manage. These results are interesting. In a true multichannel version of a catalog business model, volume is spread across other catalogs, the website, and retail stores. Typically, the catalog will drive modest amounts of volume online, and to stores. Notice that online and store channels still get a ton of volume, even if the catalog is not mailed. In these cases, matchback analyses are flat-out wrong --- much care needs to be taken to accurately read matchback analyses in a retail environment of this nature. These business models are also fascinating. Notice that catalog advertising plays a very small role in influencing business results. Online demand and retail volume are barely moved by the mailing of a catalog. Yet, in total, the catalog is twice as effective as source code reporting would indicate. There's no need to talk about online pureplays, as catalog dynamics are not part of that equation. Given what has been shared over the past two days, what are your thoughts? Does this framework make sense? What are you seeing in the business models you manage? Do you agree that matchback analyses are frequently in error, sometimes significantly in error, when measuring the incremental value of a catalog? I am looking for good blogs, authors, journalists or publications to add to my RSS reader. I have plenty of analytics, marketing, catalog and online marketing blogs. I'm looking for something different, a diversion, something that makes one think, something of high quality. In the comments section of this post, please provide links to blogs, authors, journalists or publications you respect, and read on a frequent basis. Fifteen weeks as an independent multichannel strategist provide me with a new perspective on multichannel business models. I can see that there are at least six ways that retailers/catalogers are leveraging the online channel, the channel responsible for the "multichannel" moniker. Each business model has unique advantages, and unique challenges. These businesses generate the vast majority of their sales by customers who send orders via the mail, or by calling a sales representative in a contact center. The order was stimulated by the mailing of a catalog. The online channel is not a significant driver of sales for businesses in this situation. The customer does not utilize the online channel as a shopping vehicle. At least eighty percent of the net sales happen via the mail, or via telephone. The average customer is at least fifty-five years old. These are catalog businesses that use cataloging as the primary marketing vehicle, but provide a robust online experience that causes customers to place their orders online. These businesses struggle with the concept of being "multichannel", because all analytical work indicates that the catalog drives eighty percent or more of online sales. In reality, these businesses are not "multichannel", they are really catalog businesses that take orders online. Still, it is not uncommon for these businesses to generate half of all orders online. It has been my experience that this is the least understood of all business models. These are catalogers that generate at least half of their annual net sales online. However, these catalogers typically believe that the catalog is responsible for driving the online sales. In reality, the online channel developed a foothold in these business models. If catalogs were not mailed to customers, online orders would happen anyway. This is very hard for catalog executives to understand, to digest, to develop strategies against. Company reporting and matchback reporting indicate that the catalog drives online sales. Mail/Holdout testing indicate that at least half of the online sales would happen regardless whether catalogs were mailed or not. These businesses have robust e-mail, paid search, natural search, affiliate, portal and online marketing programs that generate incremental sales. It is this business model that many industry experts and consultants target when they talk about "multichannel marketing". These are interesting business models. Be it Coldwater Creek, Williams Sonoma, Lands' End or now Dell, these businesses practice true multichannel marketing, but with a strong focus on ROI. The catalog heritage drives measurement of all advertising activities across all channels. If an aspiring individual wanted the best multichannel lab to build multichannel skills in, I believe these environments provide the best place to gain valuable, portable experience. A Neiman Marcus, Saks or Macy's fit into this business model. The online channel is strictly complementary to the store experience, as the stores are responsible for the lion's share of sales and profit. Management says the right things about multichannel marketing, and do invest in the online experience. That being said, the purpose of being multichannel is to do everything possible to please a store customer. This strategy leads to sub-optimization of the direct channel. Over time, these businesses will lead the online industry in "entertainment". The online channel (and supporting catalog channel) will likely become the entertainment and informational arm of the brand. Of course, a giant retail presence will cause a ton of traffic to migrate online, driving a huge volume of online sales. But the online sales will not be driven by brilliant online marketing or catalog marketing strategies. The online sales will happen because the online channel acts as the entertainment/informational arm of the retail brand experience. There's nothing wrong with this. But it does require a very different set of marketing skills --- traditional online and catalog marketers may be frustrated by this business model. Traditional analytics individuals may not be pleased with the depth of analytical insight required to run these businesses (i.e. the business is run by "brand instinct", not by analytical findings and ROI). These businesses are fundamentally different than the five models described above. These businesses were born online, and utilize a marketing strategy fundamentally different than other businesses. Traffic is driven by online marketing strategies. To compensate for what I call "channel disadvantage" --- not having catalogs or stores, these businesses utilize free-shipping, free-returns, and rock-bottom pricing to gain a competitive advantage. These businesses need to grow to a size large enough to overcome margin and shipping revenue shortfalls. Zappos is probably the best example of a business in this category. The online marketing departments in these companies offer spectacular laboratories for learning online marketing strategies. If I were a college student today, this would be one of my primary industries to target for employment. Strategically, it is very important to understand where your business model falls on this continuum. The way you utilize multichannel marketing and advertising strategies is highly dependent upon the customer base you have, coupled with your heritage and objectives. Cataloging makes less sense for business models five and six. Traditional cataloging strategies are frequently not congruent with brand-based retail models and online pureplays. Online marketing makes less sense in the short term for business models one and two. These business models are supported by customers who are not willing to shop on the web without the benefit of catalog merchandise presentation. Matchback and analytical expertise are probably most critical in business models three and four. Catalog businesses that migrated from model one to model two to model three have the best opportunity to overcome postal increases, because the customers shopping these businesses will purchase online if catalog frequency is reduced. Your turn, my loyal reader! What e-commerce business models are missing from this list? How might you change these categorizations to make more sense? By now, my catalog industry readers know that infoUSA is merging the Millard and Mokrynski list brands that they acquired over the past two years for a combined $20,000,000+. Many industry veterans surmised that consolidation was inevitable, and given the amount of downsizing that happened over the past year, it appears headcount adjustments weren't enough. Here's a question for my catalog readers, and I am not making any judgments here, I simply want to hear your point of view. "How will you, as a customer of Millard or Mokrynski, benefit from this merger?" Are you watching less television? I sure am. During the past three years, the DVR fundamentally changed how I use my time. This is fascinating, because the VCR existed for decades, but it didn't change my behavior. I recorded a handful of shows. Maybe I was attending a dinner, and would miss a new episode of Seinfeld. The VCR kept me current with programs I missed. For me, three things happened that caused me to stop watching television. Television became awful. I'm not sure television was ever great, but it sure used to be better. Last night, I scanned two hundred channels before settling on a thirty year old episode of MASH that I viewed a hundred times previously. I personally think September 11 changed television. How many comedies are on television anymore? Life wasn't funny after September 11 ... at least that's my opinion. You have to balance the half-dozen CSI and Law and Order franchises with something that makes you laugh. Instead, television gave us "reality" programming, an inexpensive, unsustainable, short-term profit solution to comedy. Instead of improving the quality of the programming, television improved the quality of the image (HDTV). If television is awful, then there isn't a reason to sit in front of the television for three straight hours. To me, the DVR didn't represent a fundamental change, because the VCR always existed. The DVR coupled with awful television represented a fundamental change. When there are only a handful of quality choices (quality is defined differently by each individual), one can use the DVR to create a personalized "evening of television". For instance, this morning, I am going through a week of programs like "Charlie Rose", Dan Rather Reports, and CBS Sunday Morning. Television folks call this "time shifting". I call it "convenience". These days, I can watch "Lost" on Thursday evening, when both my wife and I are at home. Television folks say the DVR allows you to skip commercials, a bad thing for the health of the television industry. We've been able to skip commercials for three decades. Bad television coupled with technology changed consumer behavior. When the price of a DVR became affordable to the average consumer, a mass shift in behavior occurred. Cable companies, the very middlemen who connect viewers to programming, hastened this shift by offering low-cost or no-cost DVRs to consumers in response to competition. I purchased my first DVR three years ago, my first HD-DVR last year. Everything changed, especially after buying the HD-DVR. Programming, advertising, cable/satellite providers, technology, the internet and pricing all interacted in a complex slurry, yielding the odd response to television we see today, an odd response ideally suited for a Multichannel Forensics analysis. Only seventeen percent of Americans own a DVR. What happens when fifty percent of Americans can afford a DVR? Maybe most interesting is what I do with my extra time. I write books, I write this blog, I volunteer. Arguably, the quality of my life is better today than pre-DVR, thanks to the "quality" of television today. It is a zero-sum game. I spent today at an all-day conference on elder abuse, part of my volunteer job. In this volunteer role, I am at the absolute bottom of the pecking order. I am the least experienced of maybe three hundred volunteers. I have a boss, who reports to a series of three managers. The three managers report to a local Director. The local Director reports to the Executive Director, who runs our volunteer program for the entire State of Washington. When you spend a decade in a leadership position, you view the world one way. When you are number three hundred out of three hundred, you view the world differently. In one job, you listen to feedback, you gain consensus, you demonstrate vision, and you make decisions. When you're number three hundred out of three hundred, you see all the ways things could be different, better. But you're an ant, your job is to move your small piece of soil into place, in harmony with all of the other ants. You look at the relationships between your leaders. You notice that one Director sits at a table with most of the managers, while another manager sits by herself, halfway across the room. You notice that your Director and the Executive Director never talk, they sit on opposite ends of the conference room. Your managers are constantly leaving the meeting to take cell phone calls. Your co-workers do not exhibit "cell phone" behavior. Some co-workers have interesting comments about the dynamics between your leaders. When you're number three hundred, you read too much into subtle gestures offered by management. Without the appropriate context or information, you make assumptions. It would be interesting to have our multichannel leaders spend time in volunteer programs, where they are number three hundred out of three hundred. There are many lessons to be learned at the bottom of the pile, lessons that can be applied to leadership. A market researcher will conduct four focus groups of nine individuals each, recommending brand-changing strategies on the basis of thirty-six customers. Your market intelligence analyst will measure market share by DMA, knowing full-well that the error rate on the estimates is plus or minus seventy percent. Your executive team oooohs and aaaahs at her findings. Then you report on actual customer purchase behavior, and remind folks that your information technology team is only able to match sixty-five percent of your retail purchase transactions to a name and address (this is called "capture rate"). Your executive team badgers you about "the other thirty-five percent", wondering if those customers behave "differently". Of course they do, they paid using cash or check or an un-trackable credit card! You share that information with your executive team. They boot you from the "C-Level" table, while the market research analyst offers a smug smile, secure in the knowledge provided by thirty-six customers. Such is the life of the database marketer. Market researchers and market intelligence analysts get free passes from the "C-Level" table that so many of you crave to present to. You will get a free pass back to the cubicle farm. Why? In a word ... "consistency". In other words, market researchers and market intelligence analysts frequently analyze metrics that behave in a "consistent" manner. The numbers don't change significantly from year to year. Therefore, your beloved "C-Level" team "trust" the numbers, even if highly inaccurate. When you analyze these results, you really cannot tell whether customers repurchased at lower rates, or if the ability of the "information technology" folks to assign name/address to transactions got worse. More often than not, when capture rate changes, the number of customers who purchase change. Most often, retail customers are using the same credit card, or are using two credit cards. 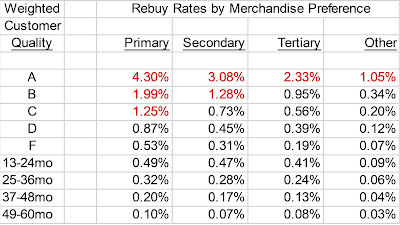 As a result, one might consider adjusting the repurchase rate for the fact that the capture rate is lower. The analyst might adjust the 20.60% repurchase rate by a factor of (75.00% / 65.00%), resulting in a 23.77% repurchase rate. In this table, customer performance is essentially equal, year over year. Another step to validate this assumption is to compare the results to comp store sales performance. For instance, if comps are flat, the table above may be reasonably accurate. If comps are up ten percent, you may need to further adjust the repurchase rate. Once you've made this adjustment, you're best off footnoting it. Your "C-Level" buddies are not big fans of "cooking the books". And yet, if you don't adjust your findings, they will not be big fans of "inconsistent data". For Database Marketers who have to report customer behavior across time periods, capture rate is probably the biggest challenge to database marketing credibility. Make sound adjustments, speak with confidence, and your credibility will improve. You work for a retailer. You are able match fifty percent of all customer transactions to a name and address, storing the combination in your customer warehouse, all tied to website and catalog behavior. Now, how do you adjust your research for the fact that you are only able to link half of your sales to a name and address? How does this influence your findings? What kind of adjustments do you make? Do you bother to share your insights with others? Do you have to defend yourself every time somebody takes umbrage with your lack of data quality? I spent eleven years dealing with these challenges. While I'm traveling, I'm hoping you can start a conversation about how you deal with "capture rate". In an amazing display of "co-branding", I observed a program on the United Television Network with a feature from NBC/Universal showing Larry King of CNN interviewing Kathy Griffin of Bravo. If you had ninety seconds to convey a concise and helpful message for new Eddie Bauer CEO Neil Filske on how to turn around the beleaguered brand, what would your message be? By the way, check out the analysis of CEO compensation at Eddie Bauer verses Nordstrom mentioned in this article. Speaking of marketing, I'm coming around to the thought that the iPod was invented to project us from the world of marketing, blocking out the audible half of marketing. Good things happen to good people! Avinash hits the jackpot, getting his web analytics book mentioned on Seth's Blog. My lost luggage was deemed a "baggage irregularity". You can't hit an FM scan button these days without running into "Jack FM", "Bob FM" or "Mike FM". I'll tune in when I hear "Avinash FM". I actually heard a pilot come over the audio system and offer a "co-branded opportunity presented by trusted business partners USAir and Bank of America". Yes, the pilot used the phrase "co-branded opportunity". Four flight attendants did a spectacular job of helping a woman who was having a panic attack, fearful that the plane was about to crash while in heavy turbulence. Quick quiz: If you aren't in the Database Marketing or analytics community, tell me what the following acronyms stand for, and how they relate to your job? Of course, e-commerce didn't die today. But symbolically, e-commerce changed today, with the ousting of Yahoo! CEO Terry Semel and a New York Times piece about the end of rampant e-commerce sales growth. Both stories point to the maturation of the online channel. To me, the New York Times article is particularly delicious, drawing the ire of Shop.org and various e-commerce bloggers (here, here and here), all quick to defend their channel at the first hint of criticism or sales slowdown. To be fair, the criticisms are valid and even enlightening --- but it was fascinating to see how defensive some of the responses have been. Those articles and comments look an awful lot like the musings of catalog executives between 1999-2003. Catalog folks were defensive, quick to defend the catalog channel when e-commerce pundits predicted doom for anything not associated with the online experience. In reality, the data used in the study has been readily available from Forrester Research for years, and publicly traded companies have repeatedly talked about this slowdown over the past year, so this news isn't news. Over the next three years, our profession will see a separation in talent. As e-commerce growth becomes harder and harder to achieve, management is going to need e-commerce folks who are skilled, maybe "gifted" at driving sales. For the past decade-plus, multichannel e-commerce executives benefited from the efforts of their catalog and retail leaders. The catalog executive mailed catalogs, the customer shopped on the internet. The online executive received hefty bonuses, the catalog executive was fired. The retail executive spent decades building a brand, the online executive received credit for sales cultivated through years of positive retail experiences. With e-commerce maturing, it will be up to the e-commerce executive to stand alone, to drive incremental sales increases without the benefit of seasoned leaders in other channels pushing free, incremental sales to the online channel. There are hundreds of really good, really talented online executives at multichannel companies. These folks honed their craft, while learning how to get things done politically, while learning offline marketing skills that transfer to the online world. These online executives will have a tremendous advantage. These are the folks who will continue to drive true incremental sales increases over the next three years, while other online businesses flatten-out, or flounder. June 18, 2007. The day e-commerce as we knew it died. Businesses with customers who purchase fewer than three times a year seldom benefit from trigger-based e-mail marketing campaigns (with the notable exception of shopping cart prompts, which often work well). There are at least three key factors that can be managed, to grow e-mail sales. Incremental list size is ultimately determined by the number of e-mail campaigns sent per week. When a customer is contacted too often, too many customers unsubscribe, driving down the total size of the e-mail list. Strategically, management may choose to execute "x" campaigns per week. Mathematically, the number of e-mail contacts per week can be determined by the number that still cause a healthy increase in the number of valid names available to be e-mailed. In the table below, you'll see that two e-mails per week are optimal, as the e-mail list continues to grow. Incremental demand per contact is also important. As you increase e-mail frequency, you will decrease the performance of any one e-mail contact. Increased frequency will probably cause cannibalization between e-mail campaigns. The table below shows that the combination of unsubs and performance dictate two e-mail campaigns per week. Targeted versions of an e-mail are important as well. Few retailers have the ability to dynamically create unique e-mail campaigns for each customer. As a result, management creates "x" versions of an e-mail campaign, offering different merchandise in each version. The analytics team decide which version of an e-mail campaign the customer receives, on the basis of past purchase behavior, stated customer preferences, clickstream history, and other factors. From a staffing standpoint, it could be a challenge to produce numerous versions. In the table below, I assume that a company managed one version of an e-mail, one time per week, to the entire e-mail file. This strategy yielded $20,700 of demand per week. Going from one campaign a week to two campaigns per week kept the file size increasing, reduced volume per e-mail, but resulted in $30,030 of demand per week. Clearly, this is a better strategy than sending just one e-mail campaign per week. Going from one version per campaign to nine versions per campaign drove $40,040 of demand per week. Assuming this strategy can be managed with existing staff at minimal cost, this strategy could work. Notice that the combination of list size (dictated by frequency), demand per contact (dictated by frequency), and version contribution cause a doubling in e-mail volume, on a weekly basis. Catalogers have long mastered this type of analysis, assigning profitability to each strategy. With e-mail, profitability is not as big an issue, so if one can avoid the fixed costs associated with incremental staffing, a move to moderate frequency with increased versions can yield a significant increase in e-mail sales. Obviously, there are many ways to increase e-mail volume. These three basic strategies almost guarantee a positive return on investment.